BRAND NEW WP17, 4MTR TIG TORCH COMPLETE WITH POWER ADAPTOR AND 2MTR OF GAS HOSE. THIS IS AN INDUSTRIAL AIR COOLED TORCH WHICH CAN BE USED TO CONVERT AN ORDINARY STICK WELDER INTO A SCRATCH START TIG WELDER. THE TORCH WILL FIT ANY MACHINE WITH A LARGE TYPE 35/50 DINSE SOCKET. (can be supplied with small type 16/25 dinse adaptor if required). THE TORCH COMES WITH LONG BACK CAP. ALSO AVAILABLE AS A WP26 (HEAVIER DUTY) TORCH, PLEASE SEE OTHER LISTINGS. 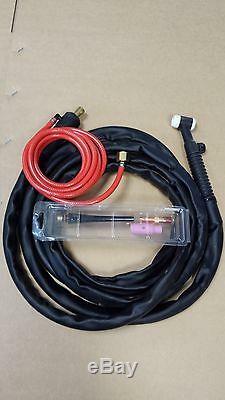 PLEASE VIEW OUR OTHER ITEMS FOR SALE, INCLUDING VARIOUS OTHER TORCHES TIG TORCH ADAPTORS AND OTHER WELDING ACCESSORIES. WE HAVE LOTS OF WELDING ACCESSORIES IN STOCK READY FOR DISPATCH. We have been designing, building and repairing all types of welding equipment in the UK for over 20 years. All new machines are built to a very high standard, using quality components and all comply with CE requirements. Tec arc will pay for return to the customer. There will be a charge if the fault or damage has been caused by mis-use by the purchaser or if no faults can be found with the machine. Because we design and manufacture welding machines, parts are kept in stocked, on our premises, and full technical back up is given if required. Any of our products can be demonstrated and collected at our premises. VAT INCLUDED IN FINAL SALE PRICE. The item "WP17 4 MTR TIG WELDING TORCH C/W GAS VALVE AND 2M HOSE for scratch start tig use" is in sale since Monday, February 26, 2018. This item is in the category "Business, Office & Industrial\Metalworking/Milling/Welding\Welding & Soldering\Welding\Gas Regulators, Valves & Accs". The seller is "yorweldsupplies" and is located in YORK, North Yorkshire.